An imam who worked at a Scarborough mosque has been arrested and faces 13 charges in connection with a sexual assault investigation. Mohammad Masroor, 48, of Toronto, was apprehended August 10 for sexual offences allegedly committed between November 1, 2008 and July 28 of this year. Police have identified five alleged victims, both male and female, and are appealing to others to come forward. Ousted president Hosni Mubarak has denied all charges of corruption and complicity in killing protesters during Egypt's uprising after a court detailed the allegations against him at the opening session of his trial. The ailing former president lay on a hospital bed inside a cage of mesh and iron bars in a Cairo courtroom as his historic trial began. WASHINGTON — The US House of Representatives has voted to establish a US envoy to protect the rights of religious minorities in the Middle East and South Asia, amid rising concern over Egypt, Iraq and Pakistan. While a marathon debate continued Friday on how to avoid US debt default, the House voted 402 to 20 to require President Barack Obama to set up the envoy post. The Senate must follow suit, but senators from both parties have voiced support. (AINA) -- The second Annual Conference of Coptic Solidarity International, an NGO for the support of the Christian Copts in Egypt and the protection of their fundamental rights, was held in Washington, D.C. on July 8-9, under the main theme of "Will Religious and Ethnic Minorities Pay the Price of the 'Arab Spring?" The main objective of this conference was to understand the implications of the current upheaval in the middle East and to offer present and future support to the Copts, and other minorities, in this difficult period. 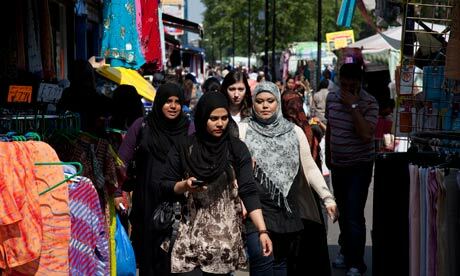 Islamic courts would be forced to acknowledge the primacy of English law under a bill being introduced in the House of Lords. The bill, proposed by Lady Cox and backed by women's rights groups and the National Secular Society, was drawn up because of "deep concerns" that Muslim women are suffering discrimination within closed sharia law councils. DUBAI // A 40-year-old tourist who insulted Islam and called the Prophet Mohammed a terrorist was fined Dh3,000 yesterday. AG, a Briton, was charged on May 18 in the Dubai Court of Misdemeanours. In his court appearance last month he was sent away after appearing in shorts. He was ordered to be suitably dressed before being allowed to enter a plea and deny the charges. In a significant legal development, the European Court of Human Rights (ECHR) has requested that the British Government state whether they believe that the rights of Christians have been infringed in recent cases where individuals have been penalised for expressing their faith in the workplace. An international interfaith conference has revealed that 105,000 Christians are being killed every year simply because of their faith. This file photo shows a sign pointing towards a church burned down by riots in northern Nigeria. The shocking figures revealed at the “International Conference on Inter-religious dialogue between Christians, Jews and Muslims,” held in Hungary, show that a Christian is killed every five minutes somewhere in the world because of their faith. “Equality under the law is a core value of British justice. My Bill seeks to preserve that standard. My Bill seeks to stop parallel legal, or ‘quasi-legal’, systems taking root in our nation. Cases of criminal law and family law are matters reserved for our English courts alone. The International Christian Concern (ICC) (www.persecution.org) a Washington D.C based Christian advocacy organization is petitioning the interim government to take immediate steps to ensure the safety of Coptic Christians, and to repeal current laws that stifle religious freedom for all Egyptians. UN Secretary General Ban Ki-moon has said that he was disturbed by clashes between Christian Copts and Muslims in Egypt, days after fresh violence in Cairo that left 12 people dead. AFP - UN Secretary General Ban Ki-moon said Wednesday that he was disturbed by clashes between Christian Copts and Muslims in Egypt, days after fresh violence in Cairo left 12 people dead. 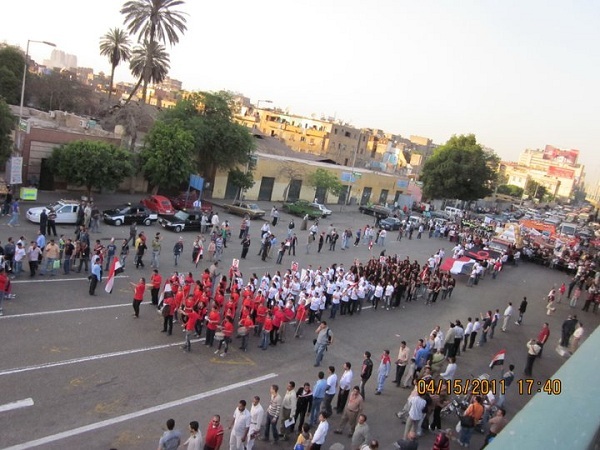 (AINA) -- Egyptian police and armed forces were heavily deployed around St, Mark's Cathedral in Cairo yesterday as Coptic Pope Shenouda III delivered his weekly sermon to nearly 10,000 church members. The sermon was also attended by the media and Muslim journalists to show their opposition to the Salafis and the actions against the church. 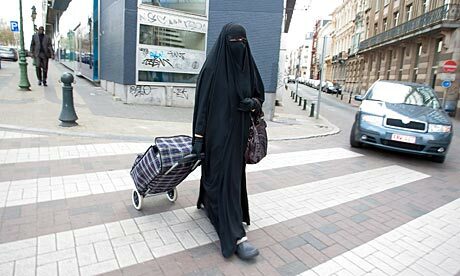 A large number of veiled Muslim women were also in attendance. 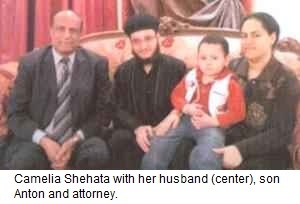 WASHINGTON — Egypt has been added to a list of the world's most severe violators of religious rights. The list was released today in the 12th Annual Report of the United States Commission on International Religious Freedom (USCIRF)/, an independent and bipartisan group that advises the State Department on religious liberty worldwide. The 380-page report also criticized the Obama administration for not taking action on previous recommendations to add offending countries to its list of "Countries of Particular Concern" or CPCs. President Barack Obama gestures while speaking to reporters about the controversy over his birth certificate and true nationality, Wednesday, April 27, 2011, at the White House in Washington. According to the commission, CPCs are governments that engage in or tolerate severe violations of religious freedom that are "systematic, ongoing, and egregious including acts such as torture, prolonged detention without charges, disappearances, or other flagrant denials of rights." "CPCs are nations whose conduct marks them as the world's worst religious freedom violators and human rights abusers," said Leonard Leo, USCIRF chair, in an email. "In the case of Egypt, instances of severe religious freedom violations engaged in or tolerated by the government have increased dramatically since the release of last year's report, with violence, including murder, escalating against Coptic Christians and other religious minorities. Since President Mubarak's resignation from office in February, such violence continues unabated without the government's bringing the perpetrators to justice." 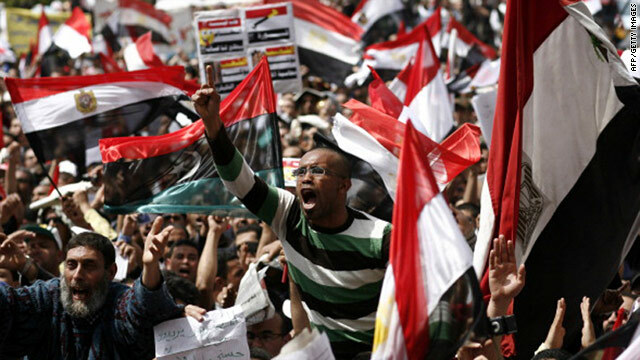 An Egyptian demonstrator shouts slogans during protests in Cairo's Tahrir Square on April 1. Cairo, Egypt (CNN) -- Egypt's ruling military council issued a stern warning Thursday, threatening immediate prosecution before a military tribunal for any troops seen participating in a planned protest in Cairo on Friday. Six Christians were killed in January 2010 as they left their church in Nag Hammadi after celebrating Christmas Eve mass. The church’s Muslim security guard was also killed in the attack. قامت الجمعية الوطنية للتغيير بالإسكندرية بربط علم مصر بين كنيسة القديسين و المسجد المقابل فى إحتفالية ضمت كل طوائف الشعب المصرى فى الإسكندرية. و ذلك رداً على الجريمة التى قام بها بلطجية الحزب الوطنى بقتل قس بصعيد مصر لضرب ما تم إنجازه بعد الثورة الشعبية المصرية. و أبلغ دليل على إن الحزب الوطنى المهزوم هو من قام بها, هى إنه و خلال الفترة من 26 يناير حتى 11 فبراير لم يكن هناك أمن فى الشارع المصرى و لم ترتكب جريمة واحدة تحت مسمى طائفية. و الدليل الآخر هو إن الفاعل لم يترك دليلاً من بصماته على الخزينة بل وجدت مادة مطهرة أزالت البصمات من على كل الأماكن بعد إرتكاب جريمته النكراء. 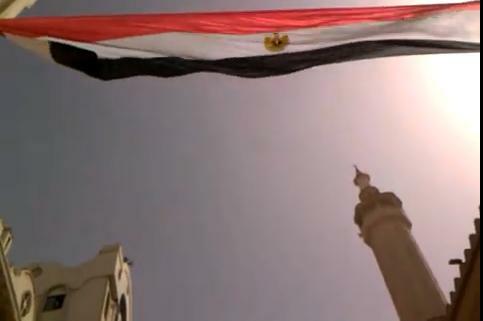 Read more: National Society for change raises the Egyptian flag between a church and a mosque "Arabic"